"I'm new to your site and I'm slowly working my way through your back catalog of posts so I don't have much experience performing tricks in the way you suggest. But I wanted to drop you a line to let you know I tried the Google Home trick you posted today for my wife and it got the biggest reaction of anything I've performed for her since we first met 12 years ago. Despite knowing it was a trick she was riveted to every step of the presentation in a way she isn't with most tricks and she yelped when the Google Home said her word. I don't know why it went so well, but I wanted to thank you and I just signed up for the year 3 bonuses. Thanks." I have a theory, Devon. Because I've had similar experiences with that effect. I thought it would just be something of a goof, but it has turned out to be a fairly strong trick for me. And I think the reason why it's a strong trick is because the narrative is unimpeachable. The "story" of the trick is ridiculous, but the structure of the story makes perfect sense. The story: The man thought his Google Home was not only listening to everything he said, but also picking up on thoughts too. So he asked it what the woman was thinking, but the thoughts weren't coming through clearly. So he had her concentrate on a specific random word, but still the thoughts weren't clear enough. So he blocked his thoughts with tin foil and then the Google assistant was able to read the woman's mind. Yes, it reads like a summary of the world's worst Black Mirror episode, but there's no flaw in the narrative itself. And while I don't think every trick you do needs to have a logical narrative that accompanies it, I do think having one makes it easier for an audience to connect to the trick, and gives them something beyond just "being fooled" to hang onto long past the conclusion of the effect. Compare the previous story to this one: The man borrowed a dollar bill. And then it disappeared. And it showed up in a lemon! That's just retarded nonsense. And that's true of most magic presentations. "Behold the classic story of a man who put a ball under a cup and then it went under a different cup." You're giving people something impossible, but not much else. Many magicians would argue that that's enough. They'd say, "Magic is about doing something impossible, not creating interesting narratives." That's a fair point of view. But I think there might be some correlation between that stance and some other things magicians say like, "Why do people just see my tricks as a puzzle to be solved?" and "Why do people think magic is just for kids?" and "Hey, let's go beg congress to pass a resolution recognizing magic as an art." Regarding Stray the Daisy, Pete McCabe wrote in to suggest that if you add an extra card to the top of the deck at the start, then you can know how many cards the spectator dealt off just by reading the number on the back of the top card, rather than reading the number and subtracting by one. This is true. And it is a smarter set-up. But beyond that, I just like the idea that in some part of Pete's mind he read something that required you to subtract by one and he thought, "There's gotta be a better way!" Dear friend, and illustrator of The Jerx, Volume One; The Jerx deck; this site's banner image; and the GLOMM logo—Stasia Burrington—recently had the first children's book she illustrated released by HarperCollins. 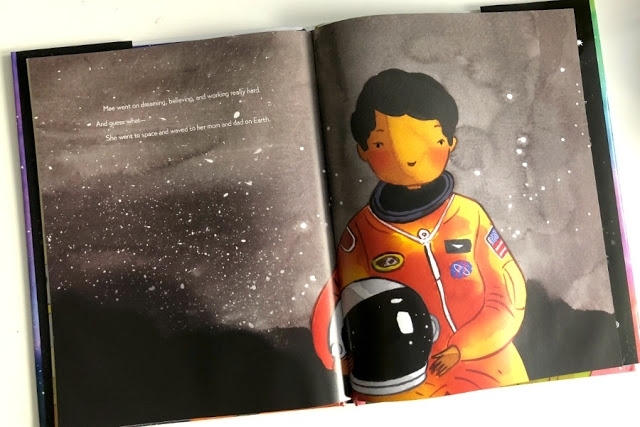 It's called Mae Among the Stars and it's about Mae Jemison, the first African American woman to travel in space. If there's a young person in your life who might appreciate the book, don't hesitate to pick it up. There may not be a big overlap in the audience for her book and my work (despite the fact that I too am a huge inspiration for young women of color), but I wanted to mention it because I'm very proud of her and happy for her success. Thanks to Chris Combs for the image.